Click Coupon code April19 for 5% OFF your FIRST Order! I am a very see it to believe it kind of person and now seeing the progress my body has made I firmly believe that bust bunny works! I have gained in size and in self confidence! 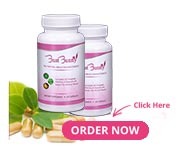 I was interested initially because I've taken fenugreek for my moods and to boost my estrogen. I'm so happy I found bust bunny instead. I have naturally low estrogen so this product is perfect for my mood swings, irritability, energy level, and overall confidence. I've experience slight breast enhancement and I'm not even through my first bottle yet. I'm excited to see my next results! Within taking this in two weeks, I’ve noticed my breast getting fuller. Not bigger, but fuller. I have been taking one in the morning and one at night, but I’m gonna switch it up to two in the morning. It has cleared up my acne, and my skin actually looks good! And it has also increased my libido a lot, thank you Bust Bunny! Works great and it's only been 20 days! I can definitely tell the firmness and fullness is in effect! Very satisfied with the results! This is all natural product. I consulted with my physician, and he approved. My breast feels plumped, and I feel great! I have been using for about few months. I was a bit skeptical when I bought the bottles but it really works! I already noticed differences in less then two weeks. My breasts got rounder and fuller. Also, I didn't have headaches during my period anymore. Really happy with the results so far! I came upon this product while searching for something to alleviate my menopause symptoms. I decided to try bust bunny because I saw it had the herb I was taking before and couldn’t find anymore at the herbal store I bought it from. I also was happy that it was a breast enhancer because I was seriously thinking of getting my breasts lifted/augmented. I’m delighted to say that this product has exceeded my expectations! It has not only helped with my menopause symptoms but also has given me the breasts I’ve wanted without surgery. I’m on my third month and have ordered three more months worth. Thank you for this fabulous product! I am 8 days into taking Bust Bunny and these last 2 days I have started to notice change in my breasts. Much rounder and feel like they are starting to grow. No side effects at all and I actually feel healthy!!! I can’t wait to see what the next few weeks have in store but highly recommend it! I was very skeptical to try bBust Bunny, but the reviews we're so good that I had to give it a shot. I'm really glad I did, my breasts already feel fuller and firmer. Thank you Bust Bunny! Before when I would take my bra off my chest basically flat, now there is actually something there. My boyfriend has even noticed a difference and asked how long I've been taking this. I haven't finished my first 30 days yet. I'm very happy. After a few weeks of using it i definitely saw some growth and they even feel a little fuller. I am satisfied already and cant wait to see the progress down the road!! I would totally recommend! I just wanted to touch base and say how pleased I am!! After breastfeeding my son my self-esteem really suffered. The stretching and shrinking from breastfeeding for a year really took its toll. As much as I would love implants the risks just didn’t seem worth it. I did research on products for a week and finally settled on busy bunny. I took them religiously and documented in photos. I took them as directed and then when my results seemed to slack I stopped. I didn’t follow the directions for weaning and STILL kept my results. I waited roughly a month and picked it back up.... I wasn’t even a week in again and my husband started making comments! I can’t thank you enough for creating a product that is safe and brings confidence back!!! Bust Bunny has a 90-day returns and refunds policy and a 97% success rate. You may notice an increase in size, fullness and firmness in three to four weeks, but for optimum permanent results you should take Bust Bunny for 3 - 6 months; individual results will vary. READ MORE. *As with all information, products, reviews, and services, results are not guaranteed and may vary from one individual to another. Statements made, or products sold through this web site, have not been evaluated by the Food and Drug Administration. They are not intended to diagnose, treat, cure, or prevent any disease. The content of this website is for informational purposes only.